Not to be confused with Fluoride. Colorless, although samples are often deeply colored owing to impurities. The word fluorite is derived from the Latin verb fluere, meaning to flow. The mineral is used as a flux in iron smelting to decrease the viscosity of slags. The term flux comes from the Latin adjective fluxus, meaning flowing, loose, slack. The mineral fluorite was originally termed fluorospar and was first discussed in print in a 1530 work Bermannvs sive de re metallica dialogus [Bermannus; or a dialogue about the nature of metals], by Georgius Agricola, as a mineral noted for its usefulness as a flux. Agricola, a German scientist with expertise in philology, mining, and metallurgy, named fluorspar as a neo-Latinization of the German Flussspat from Fluß (stream, river) and Spat (meaning a nonmetallic mineral akin to gypsum, spærstān, spear stone, referring to its crystalline projections). In 1852, fluorite gave its name to the phenomenon of fluorescence, which is prominent in fluorites from certain locations, due to certain impurities in the crystal. Fluorite also gave the name to its constitutive element fluorine. Presently, the word "fluorspar" is most commonly used for fluorite as the industrial and chemical commodity, while "fluorite" is used mineralogically and in most other senses. In the context of archeology, gemmology, classical studies, and egyptology, the Latin terms murrina and myrrhina refer to fluorite. 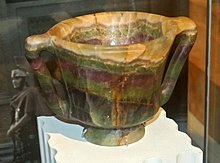 In book 37 of his Naturalis Historia, Pliny the Elder describes it as a precious stone with purple and white mottling, whose objects carved from it, the Romans prize. 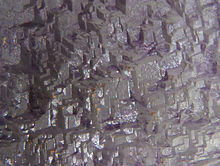 Fluorite crystallises in a cubic motif. Crystal twinning is common and adds complexity to the observed crystal habits. Fluorite has four perfect cleavage planes that help produce octahedral fragments. Element substitution for the calcium cation often includes certain rare earth elements (REE), such as yttrium and cerium. Iron, sodium, and barium are also common impurities. Some fluorine may be replaced by the chloride anion. Fluorite is a widely occurring mineral that occurs globally with significant deposits in over 9,000 areas. It may occur as a vein deposit, especially with metallic minerals, where it often forms a part of the gangue (the surrounding "host-rock" in which valuable minerals occur) and may be associated with galena, sphalerite, barite, quartz, and calcite. It is a common mineral in deposits of hydrothermal origin and has been noted as a primary mineral in granites and other igneous rocks and as a common minor constituent of dolostone and limestone. The world reserves of fluorite are estimated at 230 million tonnes (Mt) with the largest deposits being in South Africa (about 41 Mt), Mexico (32 Mt) and China (24 Mt). China is leading the world production with about 3 Mt annually (in 2010), followed by Mexico (1.0 Mt), Mongolia (0.45 Mt), Russia (0.22 Mt), South Africa (0.13 Mt), Spain (0.12 Mt) and Namibia (0.11 Mt). One of the largest deposits of fluorspar in North America is located in the Burin Peninsula, Newfoundland, Canada. The first official recognition of fluorspar in the area was recorded by geologist J.B. Jukes in 1843. He noted an occurrence of "galena" or lead ore and fluoride of lime on the west side of St. Lawrence harbour. It is recorded that interest in the commercial mining of fluorspar began in 1928 with the first ore being extracted in 1933. Eventually at Iron Springs Mine, the shafts reached depths of 970 feet (300 m). In the St. Lawrence area, the veins are persistent for great lengths and several of them have wide lenses. The area with veins of known workable size comprises about 60 square miles (160 km2). Cubic crystals up to 20 cm across have been found at Dalnegorsk, Russia. The largest documented single crystal of fluorite was a cube 2.12 m in size and weighing ~16 tonnes. Fluorite may also be found in mines in Caldoveiro Peak, in Asturias, Spain. One of the most famous of the older-known localities of fluorite is Castleton in Derbyshire, England, where, under the name of Derbyshire Blue John, purple-blue fluorite was extracted from several mines or caves. During the 19th century, this attractive fluorite was mined for its ornamental value. The mineral Blue John is now scarce, and only a few hundred kilograms are mined each year for ornamental and lapidary use. Mining still takes place in Blue John Cavern and Treak Cliff Cavern. Recently discovered deposits in China have produced fluorite with coloring and banding similar to the classic Blue John stone. George Gabriel Stokes named the phenomenon of fluorescence from fluorite, in 1852. Many samples of fluorite exhibit fluorescence under ultraviolet light, a property that takes its name from fluorite. Many minerals, as well as other substances, fluoresce. Fluorescence involves the elevation of electron energy levels by quanta of ultraviolet light, followed by the progressive falling back of the electrons into their previous energy state, releasing quanta of visible light in the process. In fluorite, the visible light emitted is most commonly blue, but red, purple, yellow, green and white also occur. The fluorescence of fluorite may be due to mineral impurities, such as yttrium and ytterbium, or organic matter, such as volatile hydrocarbons in the crystal lattice. In particular, the blue fluorescence seen in fluorites from certain parts of Great Britain responsible for the naming of the phenomenon of fluorescence itself, has been attributed to the presence of inclusions of divalent europium in the crystal. One fluorescent variety of fluorite is chlorophane, which is reddish or purple in color and fluoresces brightly in emerald green when heated (thermoluminescence), or when illuminated with ultraviolet light. The color of visible light emitted when a sample of fluorite is fluorescing depends on where the original specimen was collected; different impurities having been included in the crystal lattice in different places. Neither does all fluorite fluoresce equally brightly, even from the same locality. 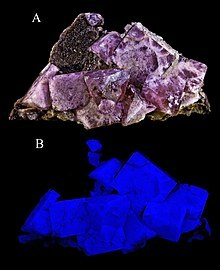 Therefore, ultraviolet light is not a reliable tool for the identification of specimens, nor for quantifying the mineral in mixtures. For example, among British fluorites, those from Northumberland, County Durham, and eastern Cumbria are the most consistently fluorescent, whereas fluorite from Yorkshire, Derbyshire, and Cornwall, if they fluoresce at all, are generally only feebly fluorescent. Fluorite also exhibits the property of thermoluminescence. Fluorite is allochromatic, meaning that it can be tinted with elemental impurities. Fluorite comes in a wide range of colors and has consequently been dubbed "the most colorful mineral in the world". Every color of the rainbow in various shades are represented by fluorite samples, along with white, black, and clear crystals. The most common colors are purple, blue, green, yellow, or colorless. Less common are pink, red, white, brown, and black. Color zoning or banding is commonly present. The color of the fluorite is determined by factors including impurities, exposure to radiation, and the absence or voids of the color centers. The resulting HF is converted into fluorine, fluorocarbons, and diverse fluoride materials. As of the late 1990s, five billion kilograms were mined annually. There are three principal types of industrial use for natural fluorite, commonly referred to as "fluorspar" in these industries, corresponding to different grades of purity. Metallurgical grade fluorite (60–85% CaF2), the lowest of the three grades, has traditionally been used as a flux to lower the melting point of raw materials in steel production to aid the removal of impurities, and later in the production of aluminium. Ceramic grade fluorite (85–95% CaF2) is used in the manufacture of opalescent glass, enamels, and cooking utensils. The highest grade, "acid grade fluorite" (97% or more CaF2), accounts for about 95% of fluorite consumption in the US where it is used to make hydrogen fluoride and hydrofluoric acid by reacting the fluorite with sulfuric acid. Internationally, acid-grade fluorite is also used in the production of AlF3 and cryolite (Na3AlF6), which are the main fluorine compounds used in aluminium smelting. Alumina is dissolved in a bath that consists primarily of molten Na3AlF6, AlF3, and fluorite (CaF2) to allow electrolytic recovery of aluminium. Fluorine losses are replaced entirely by the addition of AlF3, the majority of which react with excess sodium from the alumina to form Na3AlF6. In the laboratory, calcium fluoride is commonly used as a window material for both infrared and ultraviolet wavelengths, since it is transparent in these regions (about 0.15 µm to 9 µm) and exhibits extremely low change in refractive index with wavelength. Furthermore, the material is attacked by few reagents. At wavelengths as short as 157 nm, a common wavelength used for semiconductor stepper manufacture for integrated circuit lithography, the refractive index of calcium fluoride shows some non-linearity at high power densities, which has inhibited its use for this purpose. In the early years of the 21st century, the stepper market for calcium fluoride collapsed, and many large manufacturing facilities have been closed. Canon and other manufacturers have used synthetically grown crystals of calcium fluoride components in lenses to aid apochromatic design, and to reduce light dispersion. This use has largely been superseded by newer glasses and computer-aided design. As an infrared optical material, calcium fluoride is widely available and was sometimes known by the Eastman Kodak trademarked name "Irtran-3", although this designation is obsolete. Fluorite glass is a type of low-dispersion glass. Optical groups made with low dispersion glass have a very low dispersion (color spreading), so optical groups made with fluorite elements exhibit less chromatic aberration than those utilising a traditional flint glass. Optical groups employ a combination of different types of glass. Each type of glass refracts light in a different way. by using a combination of different types of glass, lens manufacturers are able to compensate for unwanted characteristics. Fluorite elements better complement the chromatic aberration of commercially used crown glass elements providing a more uniform dispersion across the spectrum of visible light, therefore keeping colors more closely spaced. With the advent of synthetically grown fluorite crystals, it could be used instead of glass in some high-performance optical telescope and camera lens elements. Its use for prisms and lenses was studied and promoted by Victor Schumann near the end of the 19th century. Naturally occurring fluorite crystals without optical defects were only large enough to produce microscope elements. In telescopes, fluorite elements allow high-resolution images of astronomical objects at high magnifications. Canon Inc. produces synthetic fluorite crystals that are used in their more expensive telephoto lenses. Exposure tools for the semiconductor industry make use of fluorite optical elements for ultraviolet light at wavelengths of about 157 nanometers. Fluorite has a uniquely high transparency at this wavelength. Fluorite objective lenses are manufactured by the larger microscope firms (Nikon, Olympus, Carl Zeiss and Leica). Their transparence to ultraviolet light enables them to be used for fluorescence microscopy. The fluorite also serves to correct optical aberrations in these lenses. Nikon has previously manufactured at least one fluorite and synthethic quartz element camera lens (105 mm f/4.5 UV) for the production of ultraviolet images. Konica produced a fluorite lens for their SLR cameras – the Hexanon 300 mm f6.3. In 2012, the first source of naturally occurring fluorine gas was found in fluorite mines in Bavaria, Germany. It was previously thought that fluorine gas did not occur naturally because it is so reactive and would rapidly react with other chemicals. Fluorite is normally colorless, but some varied forms found nearby look black and are known as 'fetid fluorite' or antozonite. The minerals, containing small amounts of uranium and its daughter products, release radiation sufficiently energetic to induce oxidation of fluoride anions within the structure to fluorine that becomes trapped inside the mineral. The color of fetid fluorite is predominantly due to the calcium atoms remaining. Solid state fluorine-19 NMR carried out on the gas contained in the antozonite revealed a peak at 425 ppm, which is consistent with F2. This article incorporates public domain material from the United States Geological Survey document: "Fluorspar" (PDF). ^ Anthony, John W.; Bideaux, Richard A.; Bladh, Kenneth W.; Nichols, Monte C. (eds.). "Fluorite". Handbook of Mineralogy (PDF). III (Halides, Hydroxides, Oxides). Chantilly, VA, US: Mineralogical Society of America. ISBN 0962209724. Retrieved December 5, 2011. ^ "Discovery of fluorine". Fluoride History. ^ compiled by Alexander Senning. (2007). Elsevier's dictionary of chemoetymology: the whies and whences of chemical nomenclature and terminology. Amsterdam: Elsevier. p. 149. ISBN 978-0-444-52239-9. ^ Harper, Douglas. "fluorite". Online Etymology Dictionary. ^ Harper, Douglas. "spar". Online Etymology Dictionary. ^ James Harrell 2012. UCLA Encyclopedia of Egyptology, Gemstones. ^ Reactivation of the St. Lawrence fluorspar mine at St. Lawrence, NL. Burin Minerals Ltd. (April 9, 2009). ^ Van Alstine, R. E. (1944). "The fluorspar deposits of Saint Lawrence, Newfoundland". Economic Geology. 39 (2): 109. doi:10.2113/gsecongeo.39.2.109. ^ Strong, D. F.; Fryer, B. J.; Kerrich, R. (1984). "Genesis of the St. Lawrence fluorspar deposits as indicated by fluid inclusion, rare earth element, and isotopic data". Economic Geology. 79 (5): 1142. doi:10.2113/gsecongeo.79.5.1142. ^ Korbel, P. and Novak, M. (2002) The Complete Encyclopedia of Minerals, Book Sales, ISBN 0785815201. ^ Hill, Graham; Holman, John (2000). Chemistry in context. Nelson Thornes. ISBN 0174482760. ^ Ford, Trevor D. (1994). "Blue John fluorspar". Geology Today. 10 (5): 186. doi:10.1111/j.1365-2451.1994.tb00422.x. ^ a b Stokes, G. G. (1852). "On the Change of Refrangibility of Light". Philosophical Transactions of the Royal Society of London. 142: 463–562. doi:10.1098/rstl.1852.0022. ^ Stokes, G. G. (1853). "On the Change of Refrangibility of Light. No. II". Philosophical Transactions of the Royal Society of London. 143: 385–396, at p.&nbsp, 387. doi:10.1098/rstl.1853.0016. JSTOR 108570. ^ McKeever, S. W. S. (1988). Thermoluminescence of Solids. Cambridge University Press. p. 9. ISBN 0-521-36811-1. ^ Aigueperse, Jean; Paul Mollard; Didier Devilliers; Marius Chemla; Robert Faron; Renée Romano; Jean Pierre Cuer (2005). "Fluorine Compounds, Inorganic". Ullmann's Encyclopedia of Industrial Chemistry. Weinheim: Wiley-VCH. doi:10.1002/14356007.a11_307. ISBN 3527306730. ^ "The Crawford Cup". British Museum. Retrieved 20 December 2014. ^ Capper, Peter (2005). Bulk crystal growth of electronic, optical & optoelectronic materials. John Wiley and Sons. p. 339. ISBN 0-470-85142-2. ^ "Interactive Abbe Diagram". SCHOTT AG. 2019. Retrieved February 20, 2018. ^ Lyman, T. (1914). "Victor Schumann". Astrophysical Journal. 38: 1–4. Bibcode:1914ApJ....39....1L. doi:10.1086/142050. ^ Rost, F. W. D.; Oldfield, Ronald Jowett (2000). Photography with a microscope. Cambridge University Press. p. 157. ISBN 0-521-77096-3. ^ Ray, Sidney F. (1999). Scientific photography and applied imaging. Focal Press. pp. 387–388. ISBN 0-240-51323-1. ^ First direct evidence that elemental fluorine occurs in nature. Labspaces.net (2012-07-06). Retrieved on 2013-08-05. ^ Withers, Neil (1 July 2012) Fluorine finally found in nature |Chemistry World. Rsc.org. Wikisource has the text of the 1911 Encyclopædia Britannica article Fluor-spar. Wikimedia Commons has media related to Fluorite.